LOS ANGELES - Sept. 6, 2017 - PRLog -- United Premier Soccer League (UPSL) is proud to announce that, effective immediately, 11 Premier League of America (PLA) teams have formed the new UPSL Midwest Conference. The newly-formed UPSL Midwest Conference will initiate friendlies during the 2017 Fall Season in preparation for the UPSL's upcoming 2018 Spring Season. United Premier Soccer League Commissioner Yan Skwara said, "We are very pleased to consummate this strategic partnership between the two leagues. 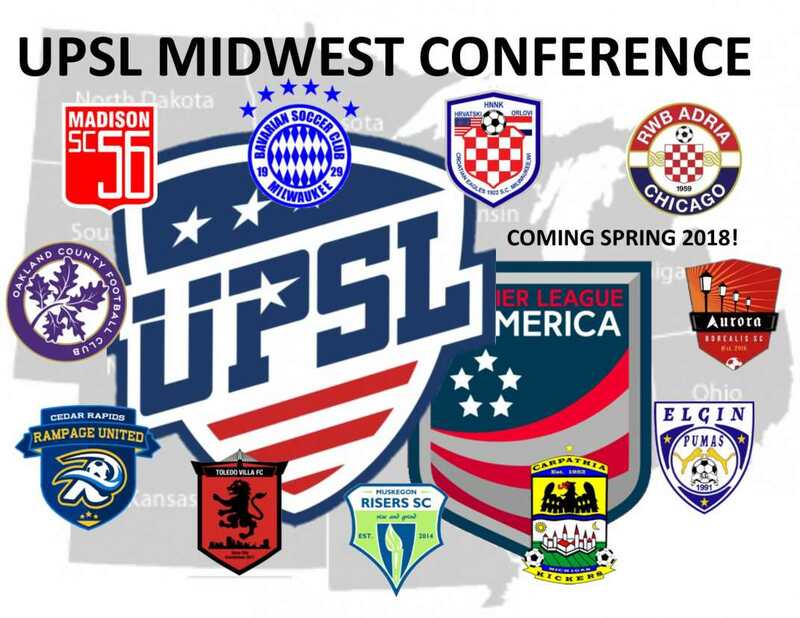 Connecting American Soccer is our league slogan, and this consolidation of new teams forming the new UPSL Midwest Conference is a testament to the desire of our team members to become one underneath a single umbrella of a Promotion/Relegation system. We are a step closer to connecting the soccer system in the U.S. that has been so fragmented for years as we now operate in four time zones as a National League. I personally want to thank Tom Zaiss and all the teams from Premier League of America that have placed their confidence in the UPSL. We as a league have an exciting future ahead of us, and we're going to elevate the game together. We look forward to an exciting 2018 Spring Season with the addition of the UPSL Midwest Conference and its new team members." The charter members of the UPSL Midwest Conference are Milwaukee Bavarian SC, Madison 56ers, Croatian Eagles SC, RWB Adria, Oakland County FC, Carpathia FC, Aurora Borealis SC, Cedar Rapids Rampage United, Elgin Pumas SC, Muskegon Risers SC and Toledo Villa SC. Premier League of America Acting President Tom Zaiss said, "All of the teams from Premier League of America are looking forward to being part of the UPSL family and helping promote the game throughout the Midwest." Teams will continue to be added to the UPSL Midwest Conference in the coming months. The UPSL was formed in 2011 and currently includes more than 90 teams in Arizona, California, Colorado, Florida, Georgia, Idaho, Illinois, Iowa, Massachusetts, Michigan, Nevada, New Jersey, New York, North Carolina, Ohio, South Carolina, Utah, Virginia and Wisconsin. UPSL is the fastest growing Pro Development League in the USA, with 100-plus teams targeted for 2018 Spring Season. Each UPSL team is individually owned and operated, and is responsible for maintaining either UPSL Pro Premier Division or Championship Division minimum standards. More information about UPSL can be found at http://www.upslsoccer.com or by following the league on Facebook (http://www.facebook.com/upslsoccer) and Twitter (@upslsoccer).